When Apple announced the new AirPods in September, consumers lost their minds. Mostly because the likelihood of losing the fully wireless earbuds was pretty high. 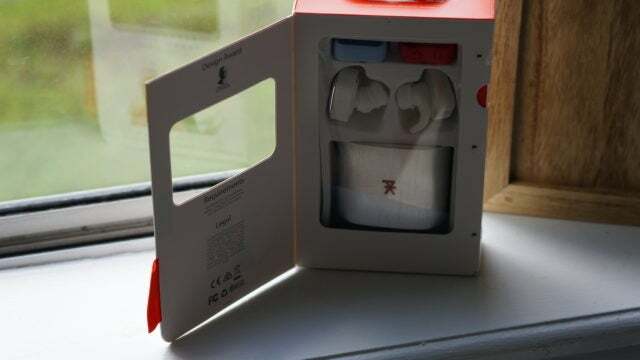 Even before Apple, another brand, PK paris, actually had nearly the same concept, albeit a different design to the wireless earbuds themselves. The PK K’asq earbuds are fully wireless, use a similar casing for charging, and are incredibly easy to pair. Designed to be worn in all environments and scenarios, the PK K’asq wireless earbuds fooled me on the first impression, but once I began adjusting them, trusting that they would stay in, and finding the best volume, they ended up working out quite well. We tested the K’asq earbuds in regular day-to-day use, on several runs including a 15-miler, and while walking in the rain. Bluetooth connections are typically a bit finicky. Usually, you’d have to pair each bud to the other, and then back to the phone, and then maybe an app just for shits and giggles. For the K’asq, it was literally as easy and powering each bud up, going into bluetooth settings, and connecting. It was as simple as it should be . Granted, Apple’s now delayed AirBuds supposedly have a one-touch setup, this was just as simple. Once connected to your phone, you’ll also want to adjust the earpieces to ensure you find the best fit. It should be a bit snug, and if it wiggles around you can also expect to lose any semblance of hearing base. Sealing them into your ear also dictates the overall quality of sound you’ll get out of this. There are also three different outside protectors in three different colors. Having dropped this a few times, they seemed to have done their job well. There are a lot of reasons this world could do with one less cord or wire, and overall PK’s K’asq earbuds made a solid effort in being fully wireless. However, regardless of wires, most of us still want high-quality sound, especially if the product is nearly $150. In the grand scheme of pricing for audio equipment, that’s average or nearly low in cost compared to the other high-performing brand offerings like Beats, Klipsch, Bose, or Audio-Technica. For these particular buds, you’re paying for the next step towards full wirelessness. As far as sound is concerned, the lows are there, and the mids and highs are certainly present, but can get muddied. There is a good bit left to be desired overall for the quality of the sound itself, but some of the other features do make up for the price. As far as connectivity, the simplicity in setting these up make them great for anyone who knows what an on-button is and where to connect a bluetooth device. Once they are connected the first time, it’s just a matter of turning them on. There were a few times when the left earbud would lose the music stream and reconnect, but that only appeared within the first few minutes of use. Through a 2.3 hour long run, that issue was only present in the first five minutes or so. Each ear is individually controlled, and if for some reason one battery dies, the other will still continue to work. As far as wireless or wireless-ish earbuds go, the K’asq will run for up to 5 hours on a charge, and the charging case will give it an additional 3 hours. In total, the case will give you 8 hours of battery life, and it will take about 1:45 to charge the buds or 2:30 for the case. For as small as each earbud is, they still managed to add three control buttons on each. One for power, and one to adjust volume up or down. The power button is a bit of a struggle, forcing you to use something like a nail to jam it on, but the volume controls work great. There are no bluetooth buttons either, it truly is a very simple process to connect these to your devices. Overall, if you are looking to ditch the wires, don’t want to wait for Apple’s AirPods (which likely won’t survive a run), and are ok with average sound quality, then these wireless earbuds will absolutely do the trick. If you are just planning on listening to music or audio and don’t mind the wires, there are better solutions for higher-quality sound. Created by French designers, the PK K’asq earbuds and case share a similar concept to Apple’s new AirBuds, but are a bit less refined. The earbuds themselves are blockly, but light. 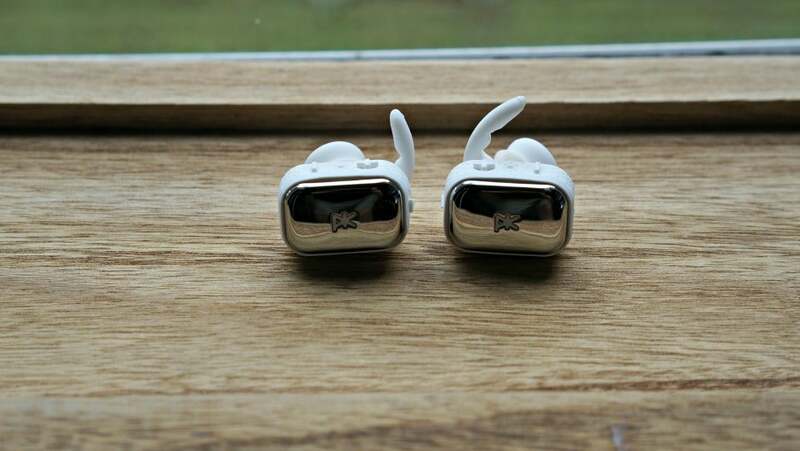 They feature a chrome finish on the outside, and an interchangeable rubber component that wraps around it. 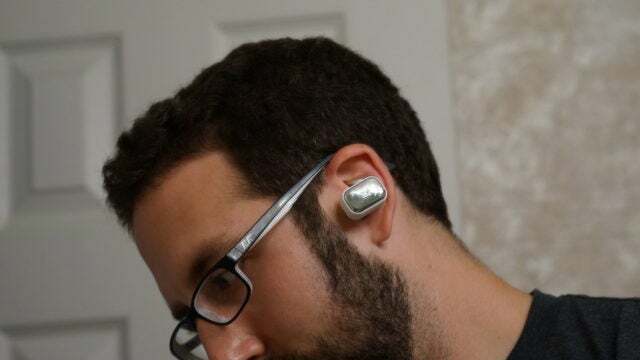 The earpieces are said to be water resistant, and they definitely made it through some long runs, but they feel a bit hard and not incredibly comfortable. The rest of the earbud, depending on if you have apparently big ears like me, may also touch your ear and feel a bit odd. As for the weight, that’s not really too noticeable. The charging case features a brushed stainless steel panel in addition to a thin white plastic. On one side is a series of three indicator LEDs to show if the case is charging or if the buds are charging. On the other side, there is a pull out USB plug that is magnetized to the rest of the case, but needs to be plugged into an AC adapter (not included). Overall the design looks nice, is functional, and can survive a decently sweaty run; however, it’s not the most comfortable. Should you buy the PK K’asq wireless earbuds? If you truly, absolutely must have earbuds without any wire, yes. Between the volume and battery life, the K’asq buds are certainly on the right track to what consumers want. They stay in, whether it be while relaxing or running, and the volume packs a punch. However, for audiophiles, you’re just going to have to wait until the technology in wireless earbuds is further refined. The bass is sort of there, but it fully depends on using the right earpieces, and highs and mids are ok, but also depend on volume and earpieces.